Both Dr. Kilgore and Angel at Mechanicsville Animal Hospital informed me about your wonderful organization and services you provide. 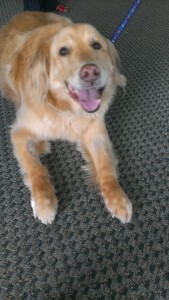 I am writing regarding my sweet dog Gunner that was recently diagnosed with Grade III mast cell tumor by Dr. Kilgore. His rather large sized tumor was removed from his neck in early March, it was “hiding” within the skin under his neck and went undetected for a while. It was discovered one day when I tightened his collar; his thick coat masked it visually. My heart sank a bit when I found it. Gunner is a 7 year old Golden/Yellow lab mix rescue that I have had since he was 6 weeks old. He looked like a little tank when I first got him with a chunky body with big ole fee and a big ole head. He has evolved into a handsome boy and savors the comments like “what a beautiful dog”; he knows exactly what they are saying and holds his head a bit higher when someone comes to pet or pay attention to him. He holds no pedigree but most people think he is a purebred buff colored Golden when they see him. His statue (all 110 lbs of him) is as big as his heart and he makes everyone smile; quite the charmer to say the least with his smilin’ face and big feathery swooshy tail and is a talker when he enters a room and doesn’t get the attention he thinks he deserves. Gunner has already endured two TPLO surgeries to correct damaged ligaments in his back legs over the course of his life – three years apart. He also has some degenerative disc problems in his lumbar spine. He has had the usual “lab” ear infections and I think has some food allergy problems that have been resolved by feeding him “grainless” dry food and he has NEVER showed that he is hurting or is in pain. I have always been able to give the best care that I could for him and his “sister”. I have no real children and have always had animals in my life. Things have been rather tough for me lately financially. I had devoted 30+ years in a career in the laboratory end of veterinary medicine. I have worked with large animals, small animals and exotics in state and private labs throughout the state. The last local veterinary clinical lab was sold to a larger corporation for the client list only and rendered me jobless for a while. Have microbiology experience saved me and I have been working at Chippenham and Henrico Doctors Hospital as a microbiology processor for a little over 5 years and have even been going back to college part-time for the last 3 years to get my certification in medical laboratory technology/clinical lab science. Since September I have been trying to complete my clinical rotations – part of and the end of my training and schooling! To be able to do this have only been able to work weekends as clinicals are daytime hours. I have two weeks left and then will graduate with honors in May. I do have some savings set aside for his treatment but they’re quickly dwindling and any help would be greatly appreciated. Hi FETCH! Just wanted to let you know that my sweet boy Gunner reached the end of his journey on this earth last week and I had to make a tough decisions on having him put to sleep. He battled his very aggressive cancer with dignity, a gentle tail wag and a smiling face. He captured the hearts of all that got the pleasure to meet and spend any time with him. He was not only giant in statue but also in heart. The Lord truly blessed me when he picked me as his owner. Dr. Waite at TOS was gold in her treatment plans and your organization gave us a bit more time together and aided Dr. Waite in evaluating some of the newer mast cell tumor drug therapies. Thank you all for all you do to help people have extended time with their special family members. Those few extra months were very special to me. Rest in peace my gentle giant! Help FETCH a Cure Beat Cancer! Happy Easter from FETCH a Cure!